“Boy” was U2’s first commercially released full length album. The album was recorded in 1980 in Dublin. Originally U2 had approached Martin Hannett, who produced “11 O’Clock Tick Tock,” to produce the “Boy” album as well. However, the suicide of Ian Curtis, the front man of Joy Division in May 1980 left Hannett unwilling to step into the role. Instead, U2 would approach Steve Lillywhite, a young producer who had gained some notoriety producing Siouxsie and the Banshees, Peter Gabriel, Ultravox, and The Psychedelic Furs. Lillywhite was working as a staff producer at Island Records. The album was recorded at Windmill Lane, and some songs were written and recorded in the studio, while others had been a staple of live performances for years. New versions of “Out of Control”, “Stories for Boys”, and “Twilight” were recorded for inclusion on the album instead of relying on earlier recorded versions released on singles. Most of the recording took place in July – September 1980. The design of the original album cover was by Steve Averill working with Bruno-Christian Tilley, the in house designer at Island Records, The cover artwork for the album’s initial release was a photograph by Hugo McGuinness of a young boy, with his arms behind his head. The young boy was Peter Rowen, the younger brother of Bono’s friend Guggi. Rowen was also previously used for the sleeve for the “Three” EP. 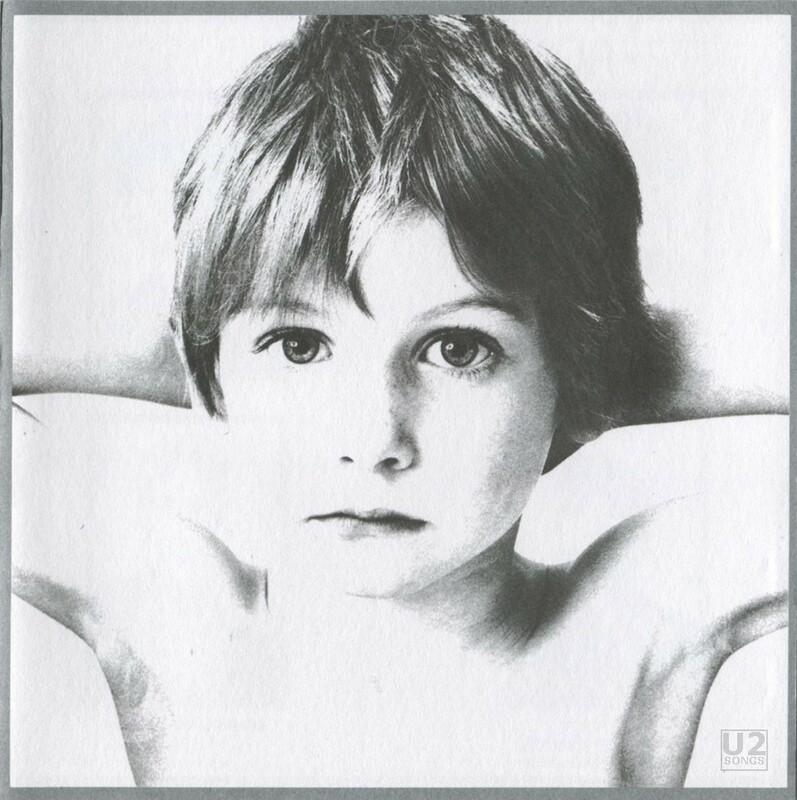 There is nothing on the cover to list the name of the album, and the only mention of “U2” is hidden in the boy’s hair. In North America the label had concerns about releasing an album by an unknown band with a child on the front cover who is wearing no visible clothing, and the album was released the following spring with a very different cover. The North American cover, referred to as the “Stretched Faces” cover, featured four images of the band which are distorted, and also has the title and name of the band displayed prominently. The cover artwork on this North American release was designed by Bruno-Christian Tilley, the in house designer for Island Records at the time. The photographs used in this North American release were by Ian Finlay. The worries at the label over an album cover with a shirtless boy would fade over time, and in 1983, “War” was released with a very similar cover to the original “Boy” cover, and it would be released worldwide. “Boy” was released on October 20, 1980 in Europe, Australia and Africa. The North American release would follow five months later on March 3, 1981. The album was released on CBS Records in Ireland, and Island Records or associated labels throughout the rest of the world. The album was initially released on 12-inch vinyl as well as cassette. Releases on 5-inch CD would come late in the eighties as the format took off. In Sweden, a special limited edition version was pressed in blue vinyl and in a 2005 column, Record Collector magazine placed that at number 5 in a list of U2 rarities. In Japan another collectible would be born when Toshiba initially released the album on 12-inch vinyl, but it was quickly withdrawn and Polystar would issue later pressings. This release came in at number 15 on the Record Collector list. Two singles were released to promote “Boy”. The first single “A Day Without Me” was released in advance of the album. The second single “I Will Follow” was released close to the release of the album in both Europe and North America. Songs from the previously released EP “Three” were also included on the “Boy” album in a re-recorded form, although this EP was released a year prior and not tied to the “Boy” album. “I Will Follow” was released again in 1982 as a live single to promote a television appearance in The Netherlands, and would also be released in 1983 to promote “Under a Blood Red Sky”. In 2011, “I Will Follow” was also issued as a single on iTunes following U2’s performance of the song at the Glastonbury Festival. All of the songs from “Boy” have been performed live by the band over the years. In fact in the early days, the band had so few songs to pick from, they would often repeat songs in the encore. Some of the songs continue to make tour appearances with “I Will Follow” and “Out of Control” still showing up quite frequently. References to “Stories for Boys” has been made throughout the Vertigo tour. “The Ocean”, “An Cat Dubh” and “Into the Heart” last appeared during the Vertigo tour. The album would reach #52 in the UK album charts. It would enter the US charts a few months later upon release, and reached number 63 on the Billboard 200. The reviews of the album were overall quite favorable. Pressings of “Boy” have yielded some variations in track listing and timing. On early pressings of “Boy” on vinyl there was a 30 second instrumental piece included. This was removed from later pressings on vinyl, and has never appeared on CD until the 2008 remastered edition of the album. This instrumental was an early version of the song “Fire”, which we learned with the remastered version of “Boy” was called “Saturday Night.” The 1989 repressings of “Boy” in Germany did include this short piece at the end of the album. Due to the CD being mastered differently in different areas of the world the CDs that were released also vary in track configuration and timing. On most European releases “An Cat Dubh” and “Into the Heart” are split so that they are 4:47 and 3:28 in length. In North America on most releases these two tracks are combined into one track that is 8:14 in length, meaning that the track numbers on the back of the CD do not match up with the actual tracks after track 3. On some releases in North America the two tracks are edited into two tracks, but the split is different than the UK split, leaving “An Cat Dubh” at 6:16 and “Into the Heart” at 1:58. The remastered version released in 2008, supervised by the Edge, broke these tracks apart and followed the UK split of 4:47 and 3:28. Overall the music is the same between all of these different edits, the only difference is in the length of each portion of the song and where the break between the two occur. The album “Boy” was remastered and released on July 21, 2008 in the UK, with a North American release the following day. At the same time, “October” and “War” were also released, and a special three-pack was issued in the USA. The remastered versions were issued on 12-inch vinyl, standard format (one disc) and deluxe format (two 5-inch CDs). The bonus disc in the deluxe version included a number of outtakes and bonus tracks, detailed in the discography entry for that release. The Edge: Guitar Player, Bono: Singer, Larry: Drummer, Adam Clayton: Bass Player. Producer: Steve Lillywhite; Manager: Paul McGuinness; Engineer: Paul Thomas. Studio: Windmill Lane, Dublin. Agent Dublin: Dave Kavanagh, Road Runner. Agent London: Ian Wilson, Wasted Talent. Agent New York: Frank Barsalona, Premier Talent. Tour Manager: Tim Nicholson. Crew: John Kennedy, Pod, Amigo O’Herlihy. LP Mastered at the Sound Clinic by John Dent. U2 photographs: Ian Finlay. “Boy” photograph: Hugo McGuinness. Design: Bruno-Christian Tilley.